Walking around Milan the other day I felt constantly drooling over some window shops in Via Montenapoleone, the luxury street par excellence. Not only the shops have exquisite taste when it comes to show their work, but you can really feel the amount of time and effort that has been put onto these firms' clothes and shoes. Obviously I fell in love with Fendi and Valentino's shoes, but Valentino had something else, everything was very lau. The colours, the style, the taste. Having a look at Valentino's runway for the 2016 spring collection I understood what I saw in Milan. Everything was inspired by tribes and ethnic patterns. 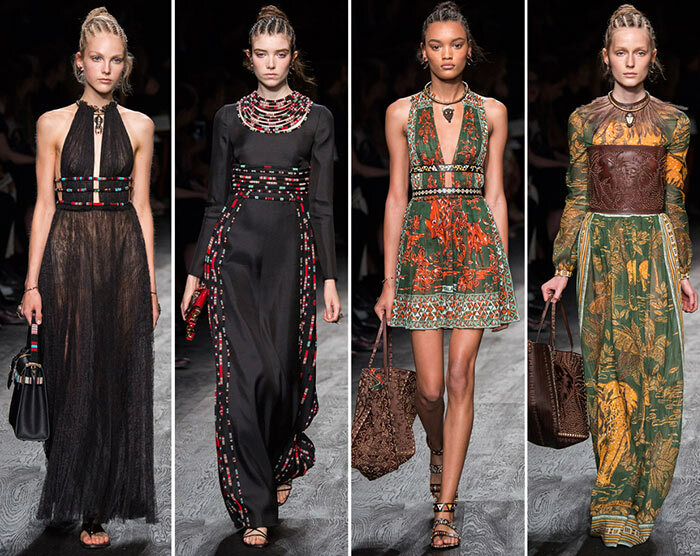 The designers had epitomised African jungles on lots of looks and the results were great. Not only that, other items were more headed to fringes trying to provoke the images of waterfalls. If only I had the right occasions (and money) to wear these gorgeous works of art!